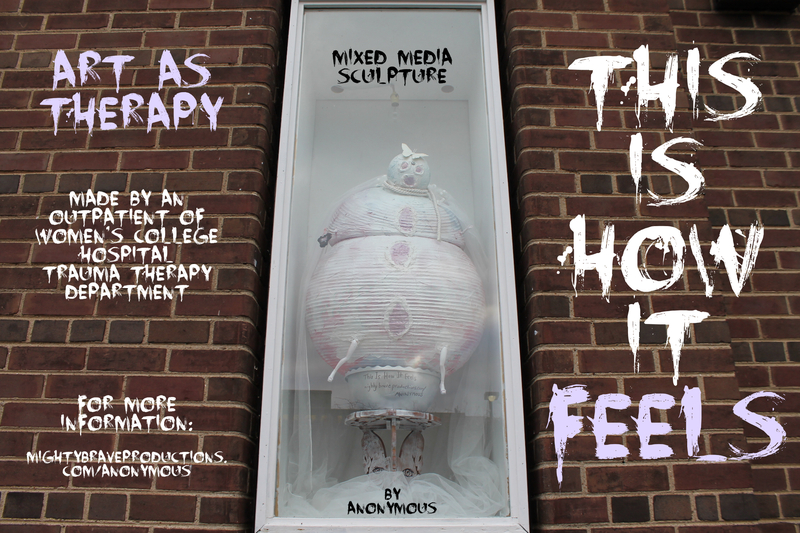 Gallery1313 Shows Anonymous Trauma Therapy Art Piece in Windowbox | A new chapter of Lisa Anita Wegner's storytelling. When I was brought on to Gallery 1313 to co-curate the Windowbox I was keen to bring work that is created through non-traditional means. 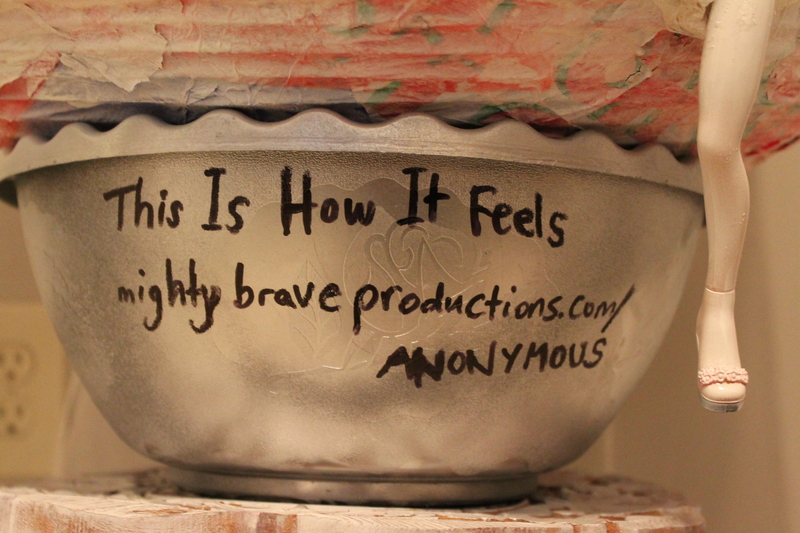 November 2014 I am proud to show “This is What it Feels Like” by Anonymous, a woman I met in 2011 in The Women’s College Hospital Trauma Therapy Department. She told me how therapeutic making art is for her and she is happy to have been given art making as outlet in the SPEAKArt Program. It resounded with me when A talked about feeling inhuman, like three unstable delicate floating balls, unable to ground herself without the help and approval of other people. She feels like she’s been put together like a delicate patchwork and despite trying to cover this with normalcy, her hiding was transparent. She feels her body is a flying machine too unyielding for her to steer. 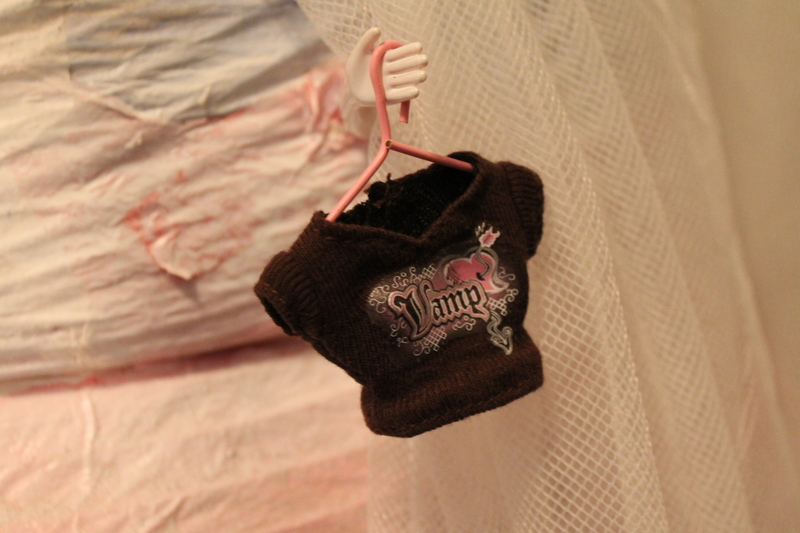 Her little useless limbs hanging there, taunting her. She needs so much support just to exist it’s like she can’t stand up without support. She feels that her loins, belly and heart are blown open for everyone to see into her. I could visualize this as she was talking. I encouraged her to create the piece for herself and asked her if she would feel comfortable showing her work in The Windowbox to help start a conversation and perhaps inspire with other abused women through making and appreciating art. 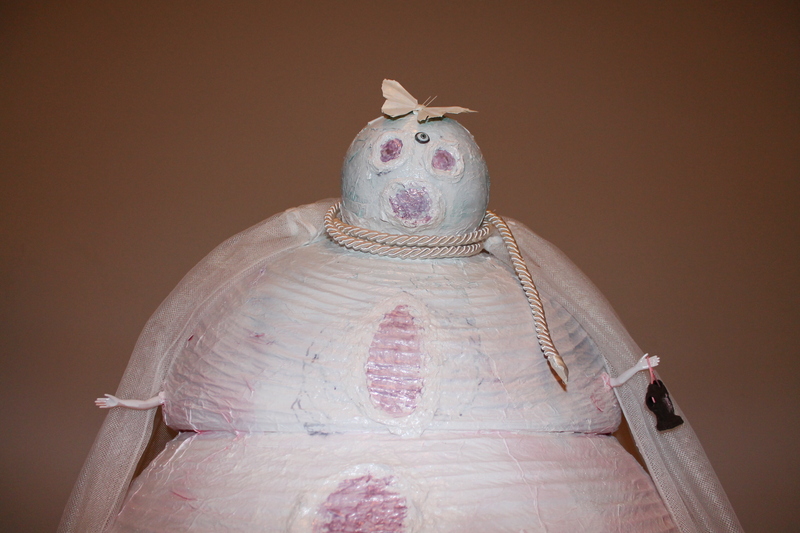 Made with tissue paper, wood, wire and found objects this piece is disturbingly beautiful and delicate self-portrait of a soul in distress. 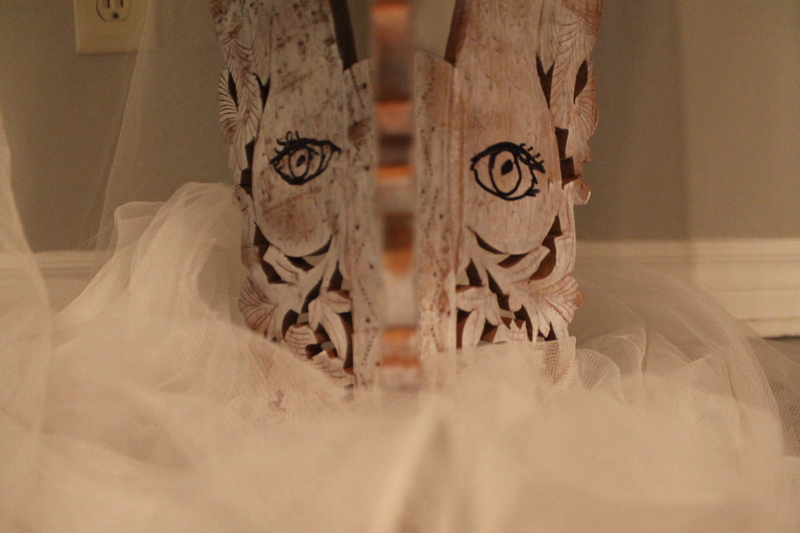 My artist finds it hard to leave the safety of her home and wishes to remain anonymous. I fee privileged to be able to translate this piece for her. 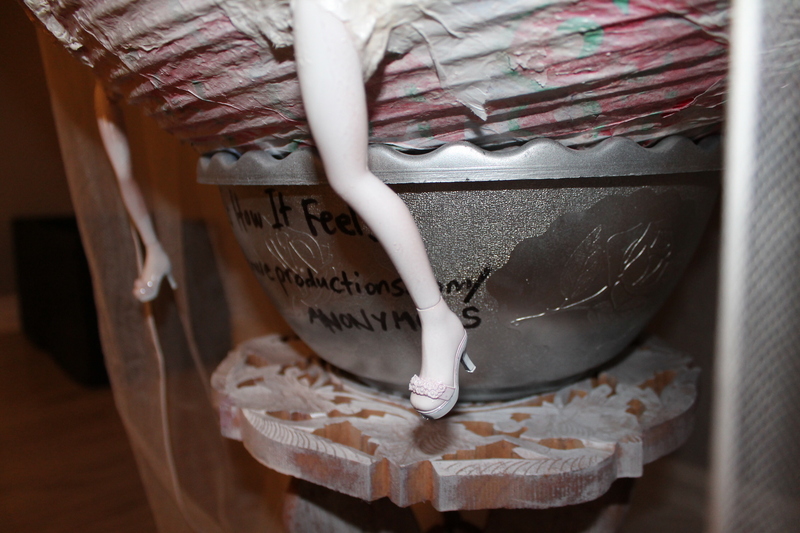 I used found objects from other projects and took the materials to her home. 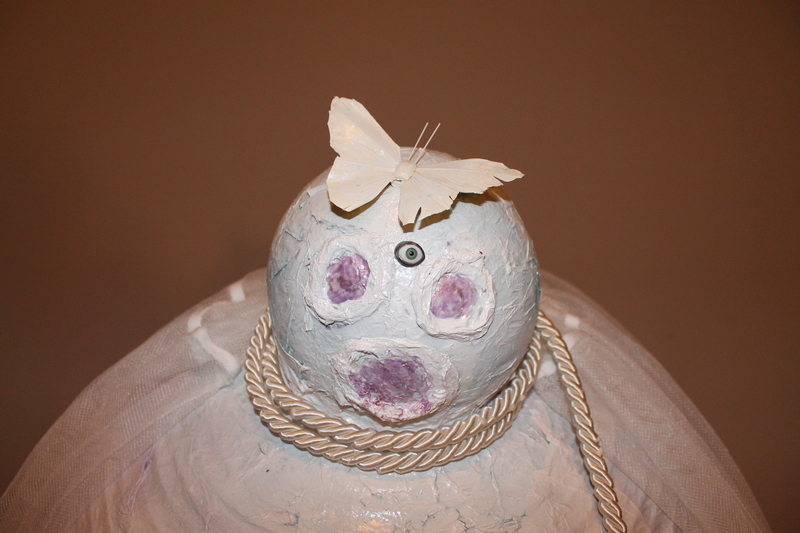 Through a simple papier mache sculpture A manages to evoke a feeling of a lost woman and her unhinged journey. While she is delicate, floating and blown open there is hope: a butterfly has landed on her and her third eye is open. She struggles with society, trying to fit into clothing that is far too small. 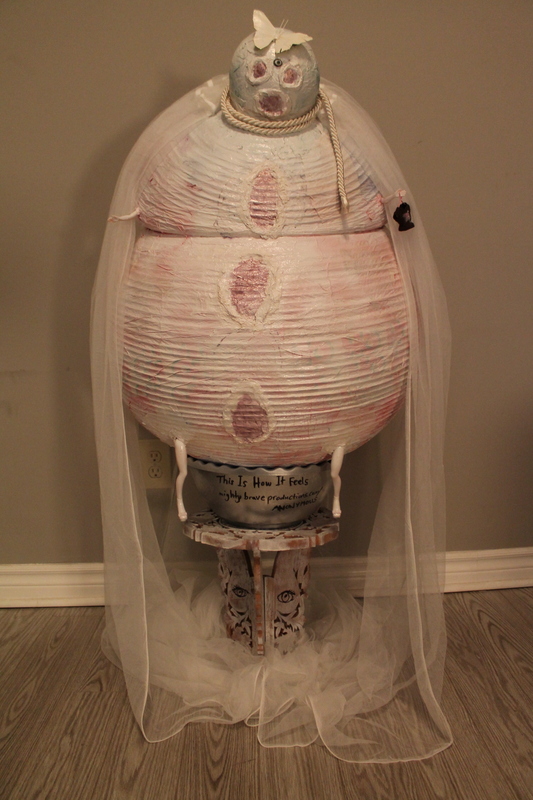 And this lady is wrapped in a bridal veil, which hides her hunched back because she feels a societal and family pressure to marry and the noose-like rope around her neck was the final touch. She considers herself a shut-in and blushed deep when I called her an artist. A is empowered for having made the leap to have created something from her imagination and feels it is helping her making peace. She will be there in spirit at the Opening.